Originally published under the title "Florida Museum Celebrates the Loss of Hagia Sophia." 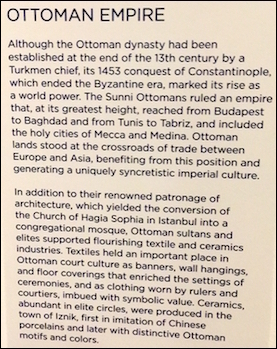 I rubbed my eyes in disbelief seeing a wall plaque at the Cummer Museum of Art and Gardens in Jacksonville, Florida, explaining an artifact in its "Ink, Silk, and Gold: Islamic Treasures from the Museum of Fine Arts, Boston" exhibit. Cummer Museum's celebration of the sack of Constantinople. Hagia Sophia happens to be one of the oldest, largest, most beautiful, most celebrated, and most important churches of all Christendom. Built in the 530s in Constantinople, the capital of the Byzantine Empire, it has always been the object of exceptional praise, from ancient times (AD 563: "as you direct your gaze towards the eastern arches, you behold a never-ceasing wonder") to modern ones (2014: "In this paradigmatic building, beauty, wisdom and light became interwoven through the architectural structure"). On May 29, 1453, after a seven-week siege, the Turks launched a final assault. Bursting through the city's defenses and overwhelming its outnumbered defenders, the invaders poured into the streets, sacking churches and palaces, and cutting down anyone who stood in their way. Terrified citizens flocked to Hagia Sophia, hoping that its sacred precincts would protect them, praying desperately that, as an ancient prophesied, an avenging angel would hurtle down to smite the invaders before they reached the great church. Instead, the sultan's janissaries battered through the great wood-and-bronze doors, bloody swords in hand, bringing an end to an empire that had endured for 1,123 years. "The scene must have been horrific, like the Devil entering heaven," says [Roger Crowley, author of 1453: The Holy War for Constantinople and the Clash of Islam and the West]. "The church was meant to embody heaven on earth, and here were these aliens in turbans and robes, smashing tombs, scattering bones, hacking up icons for their golden frames. Imagine appalling mayhem, screaming wives being ripped from the arms of their husbands, children torn from parents, and then chained and sold into slavery. For the Byzantines, it was the end of the world." Memory of the catastrophe haunted the Greeks for centuries. Many clung to the legend that the priests who were performing services that day had disappeared into Hagia Sophia's walls and would someday reappear, restored to life in a reborn Greek empire. That same afternoon, Constantinople's new overlord, Sultan Mehmet II, rode triumphantly to the shattered doors of Hagia Sophia. ... He declared that it was to be protected and was immediately to become a mosque. Calling for an imam to recite the call to prayer, he strode through the handful of terrified Greeks who had not already been carted off to slavery, offering mercy to some. Mehmet then climbed onto the altar and bowed down to pray. Recalling this violent and dismal history as I wandered the Cummer, I wondered why a Florida museum would celebrate the vicious transformation of this cathedral into a mosque. Could an Islamist be lurking behind the wall plaque's perverse praise? I searched for clues by reviewing the makeup of the "Ink, Silk, and Gold" exhibit's Advisory and Host committees. Sure enough, the answer lay there in broad daylight, highlighted on the glass entry door. Parvez Ahmed, an apologist for suicide bombing and president of the country's most prominent Islamist organization, the Council on American-Islamic Relations (commonly known as CAIR) in 2005-08, sits on the two committees; in addition, his sometime-mosque, the Islamic Center of Northeast Florida, sits on the Advisory Committee. It's worth noting on the anniversary of the sack of Constantinople that Islamic conquests need not be only by the sword - or suicide vests in concert halls. The penetration of Western culture is underway, with purposeful and intent Islamists rolling over distracted or self-critical kafirs (infidels).